Sriz Beauty Blog: Latest Fashion Trends, You Must Try!!! Of the ethnic wear options that are available for Indian women, the salwar suits are the most comfortable option. This three pieces attire offers a lot of comfort. However, at the same time, it can also be trendy and stylish. It is versatile in the sense that the dress can be easily molded and worn in many different ways. Experimentations are on with the kurta and the salwar styles. The results have been pretty interesting and amazingly trendy. The salwar suit is known to suit all women, whatever be their body type. Designer salwar kameez are fast being incorporated in casual wear and by most women who wish to break out of the monotony of wearing the humble salwar suit in the same old fashion. The salwar suit options that you can choose from are innumerable. The best way to take a peek into what is trending in the fashion circuits regarding the salwar kameez is to go through the online catalogues available on online shopping sites. You can do even better by referring to what the leading actresses from Bollywood have been wearing. You can choose the current hot favorite style of anarkali suits. These are not only comfy and trendy, but the can be styled according to what you want. You can experiment with the kurta and wear it short, or floor-length like a gown. Designer anarkali suits are a sure bet in bailing you out of a dilemma over what to wear and how to wear it!Here is a cursory guide to the leading fashion trends in salwar suits that’ll help you make the most fashionable choice! 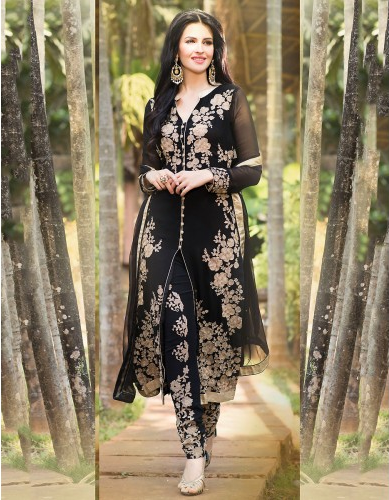 This black georgette A-line salwar suit is extremely trendy. The flowy body with beige colored patchwork is the perfect friend for your body type. The salwar in shantoon material also has patchwork embellishments that add to the elegance of the dress and make it classy. The dress comes with a chiffon dupatta that you can drape on your body in whichever fashion you please. It would only add to the beauty of your attire! This one is another salwar suit in the straight cut style. The black georgette material gives the attire an ethereal and flowy look. There is embroidered patchwork and the colorful floral pattern adds a fresh dash of color. The gold border at the bottom works well with the black and the fuchsia colored bottom is a stroke of fashion genius! This salwar suits is one of the must have items for your clothes closet. The flowy anarkali suit that Karishma is seen wearing here is stunning and trendy at the same time. 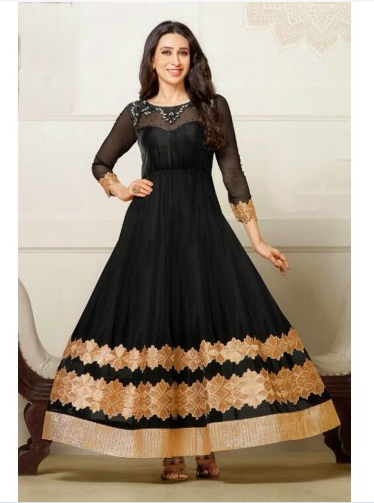 This black georgette anarkali is amazing with its floor length gown like look that makes it perfect for a party. The rose gold patchwork on the bottom of the kurta and the sleeves adds enough drama to the dress, making it a gorgeous number. This latest anarkali suit is sure to make you look like a princess, focusing everyone’s attention solely on you!